With the little helpers both now in High School, we are finding ourselves spending more time in town. Between before school music practice and after school sports training, our days are very full and busy. As they should be. Whilst part of me hankers for the simpler times when the boys went to our local primary school just down the road, they are growing up and are relishing in the new experiences and opportunities that a large school provides. As we have now lived at the new Rock Farm for over 12 months, we have also started (albeit slowly) renovating the house. The first priority is the installation of a large efficient slow combustion fireplace. There is nothing like a cool morning to focus the mind and allow you to recall how cold the house was last year. This means the farm part of the Rock Farm is not getting as much time for my attention as I would like to give it. There has still been plenty to keep us busy, checking the stock water daily and moving the cattle and sheep into other paddocks. Of course there are some gorgeous horses nearby that also demand attention – and somehow I always find time for a pat. The cattle have been eating the remaining grass, and giving some of the weeds a good nibble in their quest for food. They remain in good condition, which they will need heading into winter. The skies, whilst looking promising have only yielded 2.5mm in the past two weeks. The unseasonably hot days have burnt away any remaining moisture. The sunsets though have been spectacular – and make me pinch myself every time. The dry weather has put a lot of the trees under stress. The native gum trees have a very effective method to cope with droughts. They shed branches. Unfortunately most of our trees are along fence-lines, requiring a bit of work to clear the branches. Thankfully most of the branches were relatively small – and I was able to make some handy little piles of firewood for collection in a year or two once they’re seasoned. I even was lucky enough to have a helper for a couple of hours – but he got distracted talking to the girls! And then the helper wandered over and poured a bucket of oats on the ground for the other girls (and nearly ready) boys. The sheep are managing to find some good grass among the weeds, and are all in healthy condition. We have a few of our neighbour’s dorpers running with our sheep which are wiltipolls. Both types naturally shed their wool and are bred for their meat. The dorper tends to be a stockier animal, and tend to look more shaggy. We sold most of the female ewe lambs, but are growing out the boys. I will fast have to make a decision as to whether we send the boys to the sale yards, our put them in our freezer. With two teenage boys in the family – I think that keeping the food miles to an absolute minimum will be time well spent. I just have to find that time…. You may recall that a few weeks ago we took up the kind offer of John, our heifer’s breeder, to join our girls with one of his young bulls. Getting the girls there proved to be a bit of a challenge, especially for one of our heifers now known as Miss Steak. She didn’t travel with her friends after getting stuck and injuring herself – see previous blog: https://rockfarming.com/2018/11/16/a-terrible-miss-steak/. After training her to enter the horse-float, she travelled without any complaints at all. When we arrived, I drove straight into the paddock, and she had a welcoming committee come down and greet her. We had also been keeping a close eye on one of the heifers. Over the previous month or two, it became apparent that she was pregnant. This can be a big problem for young heifers, especially if they have large calves. We weren’t sure what to expect, and were worried we would lose the heifer. Renamed “The Unchaste One”, she gave birth without incident to a handsome bull calf. The cattle continued to grow and put on condition at John’s place. The Crookwell area seems to have escaped the worst of the drought conditions that have caused so much devastation elsewhere. Thankfully the rest of their time at John’s proved to be without incident, and we went to bring them home the other day.. The heifers first came to our place on Jimmy’s truck as weaners. On their first trip, they easily fitted in the front two pens. Now they are much closer to 400kg each, several overflowed into the rear pen. I was pleased to see how quickly they settled back at home. I kept them in the yards for just a few minutes, letting them find the water trough. When I let them out, they barely moved half a dozen metres before they stuck their heads down and happily commenced grazing. We have all missed having the cattle on the place, and love having them back. We have since moved them into a paddock with more shade – helping them through the worst of the current heatwave. In other parts of life on the Rock Farm, the run of 40 degree days has been pretty hard on our newly planted oaks. Some of our seedlings have clearly struggled, but others look like they are doing alright. I think they all appreciated a drink. Hopefully we can nurse them through the summer and give them a fighting chance at survival. It has been a long Spring full of unfulfilled promises on the Rock Farm. Weather forecasts predicting a 90 percent chance of 10 – 15mm of rain in three days time have withered to a 10 percent chance of 0 – 1mm. Barely any rain has fallen, and the grass has been in a desperate race to set seed before it dries out completely. The photo above captures the half dozen drops that fell a couple of weeks ago. Whilst the sky looked promising, it failed to deliver. Readers may remember that I had a paddock full of thistles when we moved to the Not-So-Rocky Rock Farm. I slashed the thistles a couple of times over the summer, with the aim of preventing the thistles going to seed. (https://rockfarming.com/2018/01/04/managing-thistles-on-the-new-farm/) After slashing the paddock, the sheep moved in, and kept the grass down over winter – until about three weeks ago when the took it upon themselves to move out (The fences have never held the sheep anywhere – even this paddock which is mostly fenced with hingejoint). The culprit was Barley Grass. Barley Grass (Hordeum Leporinum) is a soft annual grass with bristly fox-tail like seed heads. Once the seed heads form, it is unpalatable to sheep or cattle. The seed heads get embedded in the sheep wool, reducing their capacity to put on weight. Given the option to move out, our sheep had done exactly that. On the flip side, the thistles were not so prevalent, which was pleasing to see. HerbiGuide recommended heavily grazing the paddock until the seed heads turned yellow. I brought in the cattle, and gave them a week to reduce the seed burden in the paddock. It was also a good chance to check out some of the serrated tussock I sprayed a month earlier. It seemed that the fluproponate was effective, which was a relief. After a week of grazing, the cattle had reduced the barley grass a little, however the hot dry weather had started to turn the seed heads yellow. In a last minute effort to reduce the grass seed being viable, I removed the cattle and took the mower down to the paddock and slashed the remaining stalks. I am not sure if I have managed to cut the heads before the seed is viable, but it may allow the sheep to move back in and graze the stubble in the lead up to the end of the year. I hope that grazing and slashing the paddock will significantly reduce the prevalence of barley grass over the next couple of years. I will need to heavily graze the paddock in late winter and spring before the seed heads form. The cattle and sheep will form am integral part of this process, and it is exciting to be using the livestock as a tool to improve the pastures on the Rock Farm. We are now at the end of the grass growing season. Whilst is rain forecast this week, it will do little to increase our feed for the stock. What it may do is replenish some water in our dam, which is looking very low. We are investigating options for stock feed and agistment, and will update you soon on where we are at with this. In the meantime, we will keep our fingers crossed. At this time, we will take any rain we can get! The Rock Farm has been fortunate to receive a little bit of rain over the past couple of days. A cold front that blasted the South West has made its way across the country, bringing cold moisture bearing westerly winds. A steady 20mm of rain over two days followed up on 7mm received a week ago. It is amazing to see how quickly things change. Hills that were a lifeless brown a week ago now have a green tint. I now have the delightful problem of having to put the car into 4WD to get up the driveway! If there is one thing that cold wet weather brings on, it is lambing. And no one summed it up better than Dog, in Murray Ball’s timeless Footrot Flats. I knew our girls were close to lambing, but it must be a cruel twist of nature to lamb in the worst possible weather. I took the opportunity of a short burst of sunshine and went for a little walk around the paddock. I was delighted to find five new lambs to three very proud ewes. I hope these little lambs, and their yet-to-be-born brothers and sisters find enough shelter in the paddocks to pull through the last few weeks of winter. The cattle are curious animals, and we love having them on the property. This photo was taken a day or two before the rain, and you can see how happy they are to see me with a couple of bales of old pasture hay. This morning I moved them to a laneway. They must have been hungry, as they stuck their heads down and started eating as soon as they walked out of the gate. They’re still in pretty good condition all things considered and are pretty happy to see me – especially if I come bearing gifts! Whilst the grass now has a green tint, it is still too cold for it to grow. Like everyone in the district, I hope we get follow up rainfall to build moisture in the soil. It is the deep soil moisture that will be the difference between a good spring, and some difficult decisions. The little bit of moisture has been a good thing. It has allowed us to plant a stack of acorns. We planted acorns from locally sourced Daimyo Oaks (Quercus dentata) and Californian Valley Oaks (Quercus lobata). The Hamilton Tree Planter was the perfect tool for the job – however it was abundantly clear that only the top 5 centimetres of the soil was damp. Underneath it was bone dry. This is part of our plan to use deciduous trees to enhance the soil health on The Rock Farm. We have also planted some native seedlings. Our local real estate agent donated some seedlings to members of the community for National Tree Day. We gratefully received a Yellow Box (eucalyptus melliodora) and my favourite tree, a Drooping Sheoak (allocasuarina verticillata). The Yellow Box is a magnificent slow growing tree, considered the best native tree for honey production. It prefers areas of better soil hence, in this area, large areas of yellow box woodland were cleared to make way for pastures. 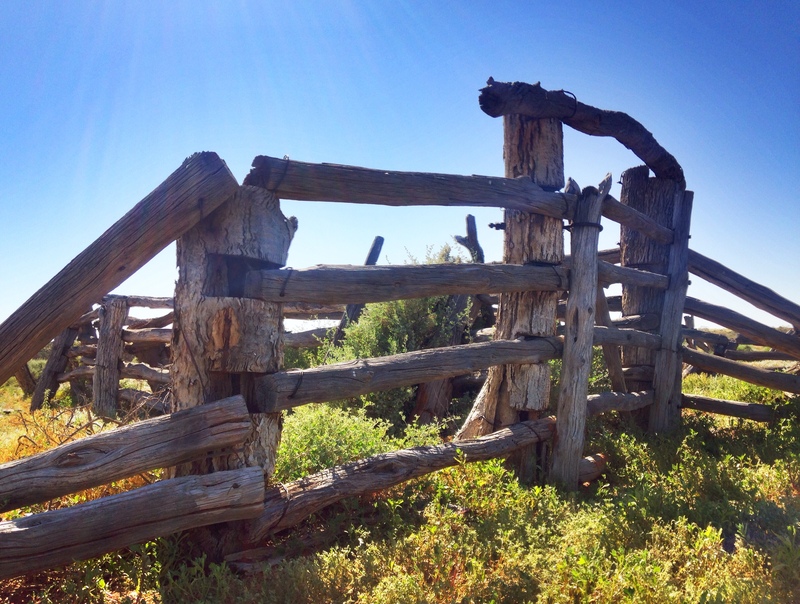 The timber is dense and resistant to decay, and was used for railway sleepers, posts, poles and for timber bridges. It is great to be re-introducing this tree to our property. The Drooping Sheoak prefers dry shale slopes. It is just about the sole food source for the glossy black cockatoo, which is rare in our area. We had seven of these trees on our last property, but I haven’t found any on the new Rock Farm. Kangaroos find this little tree irresistible, hence we made tree guards to give it a fighting chance. Special thanks to Chris and Gin from McGrath Real Estate for their generous donation to the community for National Tree Day. Work has continued on our improved stock yards, albeit a little slower after my father returned home. I was really happy with the new layout, but had a bit of work to finish the yards, and make them suitable for handling sheep as well as cattle. The design of cattle yards world wide was revolutionised by Temple Grandin. She recognised that cattle move much more effectively along a curved chute. She also realised that if the yards are visually solid, the cattle are far more likely to move towards open areas. It is hard to incorporate all her ideas in such a small set of yards, but we tried as much as possible to follow her philosophy in our design. The yards are a mixture of panels, with various shapes and sizes bought at different times. We were able to re-use all the panels – although at times we had to get a bit creative to get the joining pins in place. My main focus was to ensure the exterior sections of the yards were stock proof, and in the areas that would receive the most pressure, I fixed the conveyor belt to the panels. Fortunately I had an old length of conveyor belt in the ‘resource centre’ that could serve two purposes. 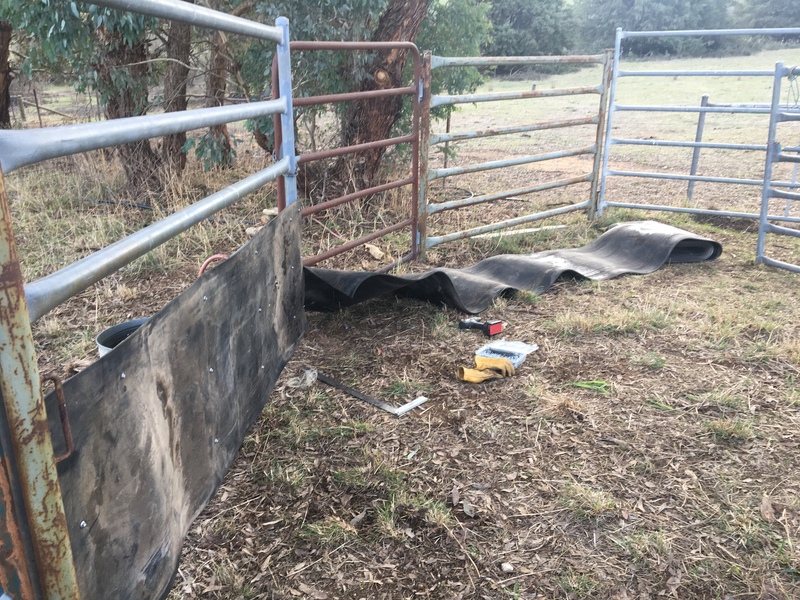 It will provide a visual barrier for the cattle and a physical barrier to keep the sheep, especially lambs, in the yards. Unfortunately the belt is extremely heavy to work, but once it is unwound, it becomes a little more manageable. The supervisor wasn’t much help! Although to be fair, the afternoon sunshine was rather soporific. The holding yard was another story. We created a large yard using panels and weld-mesh. Weld-mesh is not ideal for yards. Horned stock can get their horns caught in it, and younger cattle and sheep can get their feet and legs tangled also. But in this yard, the stock will not be subject to the same pressure they are in the holding yard, and again we used curved lines as much as possible to encourage the stock into the forcing yard with minimal fuss. The mesh was fixed to the panels using tie-wire. It is a lot better than the gates held together with bailing twine that were used to form this yard originally. And so, what do the stock think of it? The Little Helper and I only rammed in the last anchor a couple of days ago, so we haven’t got around to testing the improved yards yet. 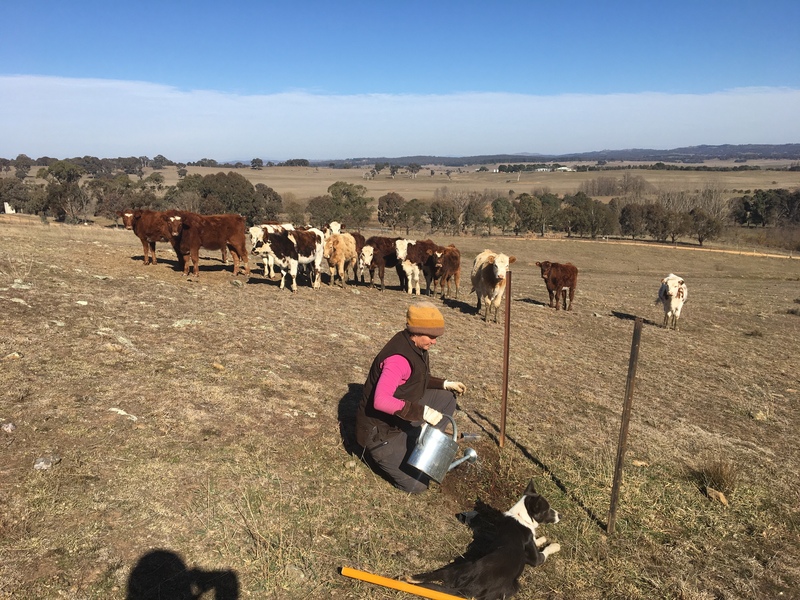 I have continued to move the cattle every week or so to a new area, and they are really responding well to a gentle nudge – but it will be a few more weeks until I have them back in that part of the farm. 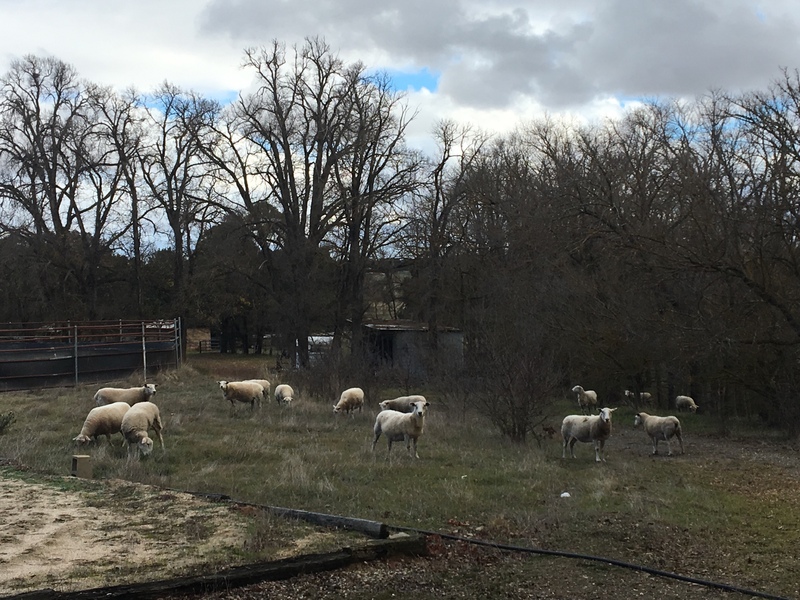 It is a relief to know that if we do need to bring the sheep or cattle into the yards for any reason, we now have a safe and secure place to work them. 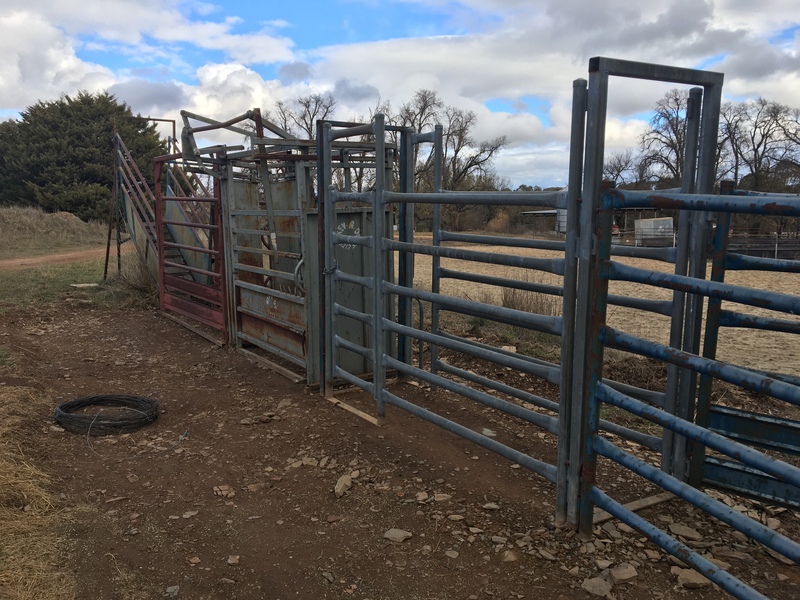 Owners of livestock must be able to handle their animals safely, and one of the most effective ways to do this is with a set of stock yards. Yards typically used to be made with whatever material was at hand. 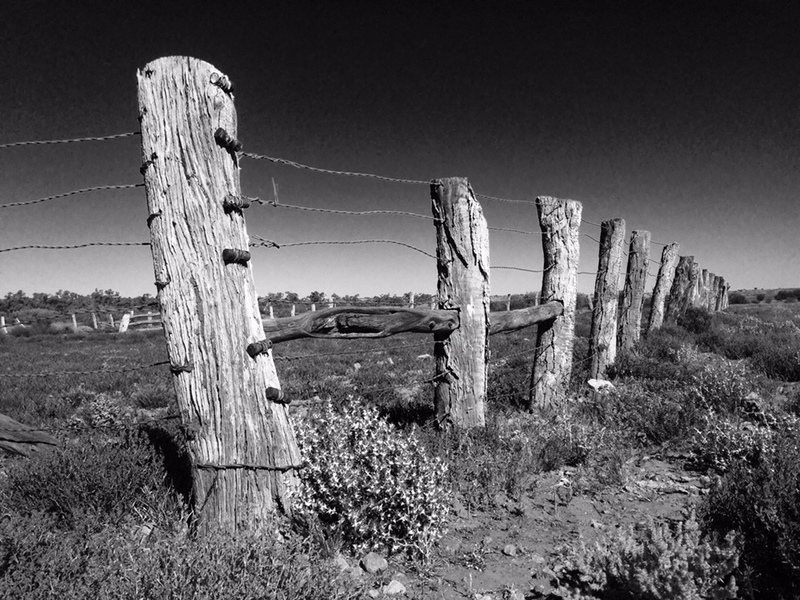 We visited these old yards in northern South Australia a couple of years ago. 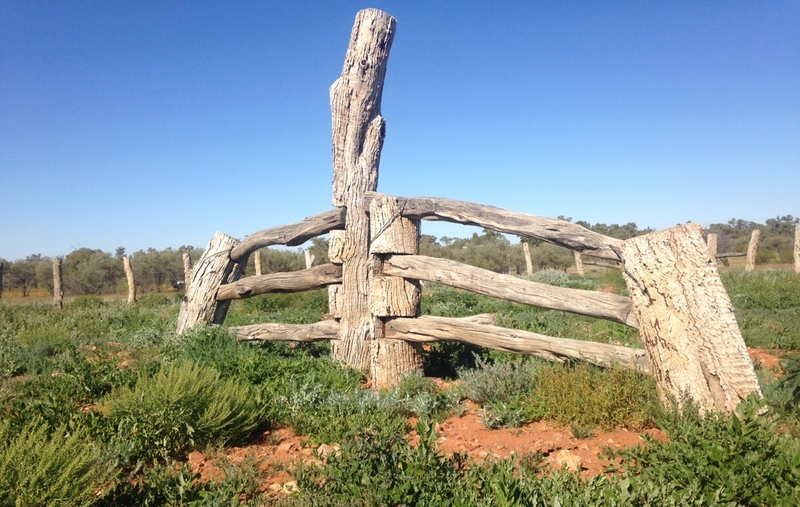 The yards were made with Cypress Pine hauled from the Flinders Ranges, and the wires were old telegraph line. The cattle were mustered into a square yard. If stock were to be handled, horsemen would rope the cattle and they would be brought to the Bronco Rail for marking. The steel yards on the Rock Farm might be much more modern, however due to a number of reasons, they were in need of a major overhaul. Before the cattle arrived, it had taken me several hours, lots of grease and much motivation with a hammer to get the crush to operate. 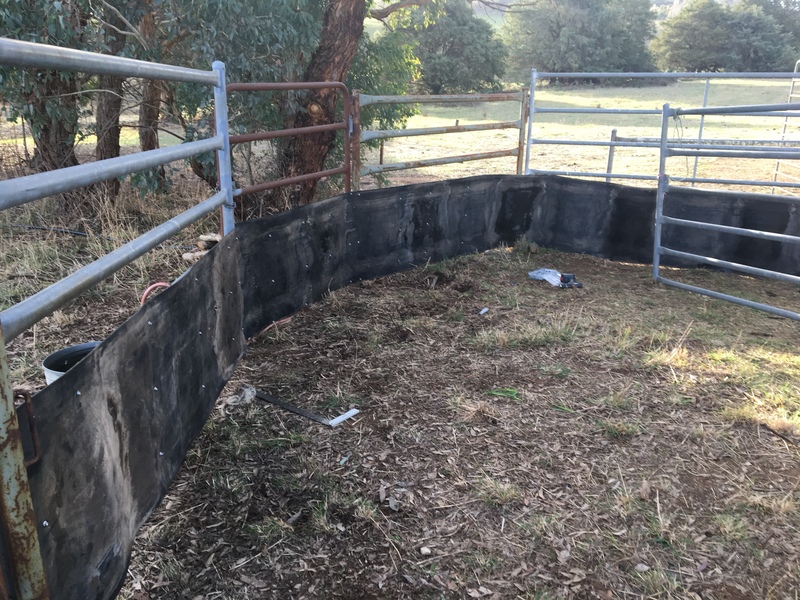 The yards had been placed on the ground with little consideration to levels, and whilst the basic layout was sound, I wanted to update the yards to ensure many more years of safe and low stress cattle handling. With a short notice visit from my parents announced, the time to re-design the cattle yards arrived. My father has years of experience in the beef industry, including designing cattle yards. It was the perfect opportunity to harness his experience and my brawn… well the tractor’s brawn. We had a good look at the existing layout. My proposed design sketches were quickly discarded as I hadn’t taken into account the simple fact the crush is worked from the left hand side. I had designed yards with a clockwise movement that made it difficult to operate the crush. We agreed that an anti-clockwise movement of the cattle was far more suitable. 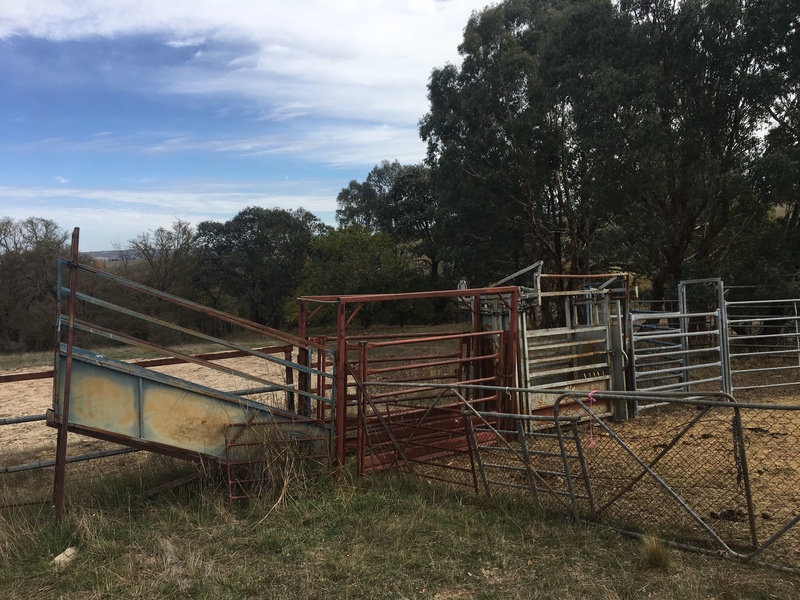 I also studied the NSW DPI page on Cattle Yard Design, but ultimately it came down to a simple examination of the materials at hand, and the site available. The first stage was dismantling the existing yards. This involved removing a few pins and many cobb and co wire hitches. With a collection of mis-matched panels and various old gates, it was an interesting exercise. Once we had removed the old yards, we spend a long time digging out and leveling the ground, appreciative of the tractor doing most of the heavy work. Cattle will naturally run uphill, so the slope on this site isn’t a problem. What we needed to do was make the slope consistent through the length of the crush and race. With the slope consistent, we started re-assembly, again using the heavy lifting ability of the tractor. Reassembly took a lot longer than I thought. We have managed to get most of the panels to line up, but the hard work is getting the sleeves for the pins to align. We had to grind off a couple of the sleeves to make the panels fit, all made slower due to a few hours lost fixing the pull-starter on the generator. We concentrated on getting the drafting gates, crush, race and forcing yard all aligned and in-situ. We found an old balustrade in the ‘resource centre’ which we cut up to manufacture new pins and anchor pegs in lieu of too many cobb and co hitches. The main section of the yards are pretty much fixed now, and are much more solid that the previous version. We still have work to do on the holding yard, and I hope to get onto this in the near future. The final component will be to put a sight barrier on the yards. This will remove distractions and help move the cattle around the yards. I also hope it will make the yards sheep proof, so I don’t need to build a second set of yards for the sheep. And what do the stock think of all this effort? At present I am still a few weeks away from getting the yards ready for stock work. The cattle are busy mowing and mulching our small horse paddocks. The sheep seem to hang around in this area too, happily making their way around the farm as they seek the sweetest grass. Some of the ewes are getting quite heavy with lamb, and I will need to have the yards ready to vaccinate the ewes soon. Nothing like a bit of time pressure to finish a project! One of the most important goals we have for the Rock Farm is to ensure that we leave it in a better state that we received it. I am really excited with the soil analysis results we received last week, as it will provide a scientific bench mark that we can use to measure our progress. Whilst the soil analysis reveals the mineral composition of the soil, it doesn’t reveal much about the biological health of the soil. This microbial activity is far more important, and if we can get this balance right, we will be doing really well. It is inspiring to read of people who have used various techniques to actively build top soil and repair the health of their land. Somehow I believe the key to our survival is in the health of our soil, because from it we derive all our food. One technique to improve soil health I mentioned in my last post was grazing management. André Voisin and later Allan Savory developed what we now call holistic management or cell grazing where soil health can be improved by how you graze the land. Cell grazing involves heavily grazing small areas over a short period, followed by a long rest. 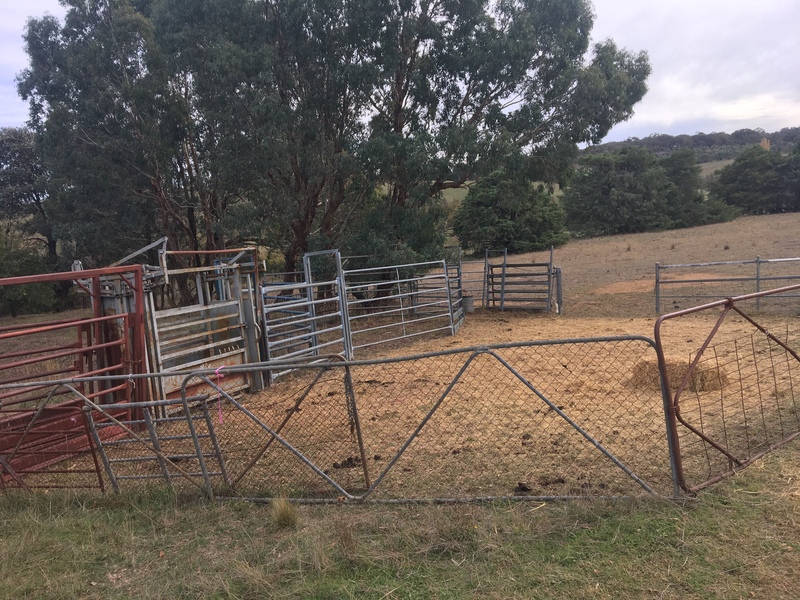 It is expensive to set up, requiring lots of small paddocks (fencing is ridiculously expensive and water must be provided to all paddocks), and time consuming to manage, as stock need to be rotated frequently. 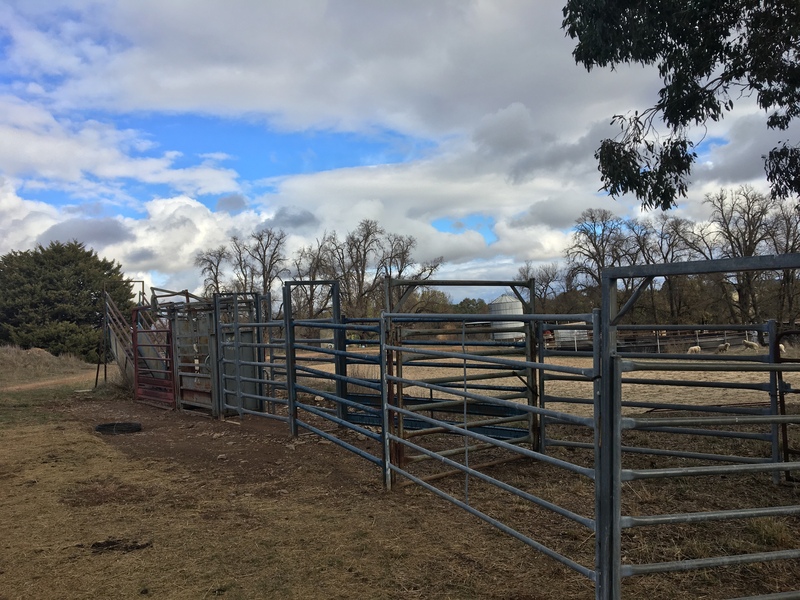 We are lucky in that the new not-so-rocky Rock Farm was initially established to spell race-horses, so has several small paddocks that we can use for this purpose. And whilst we have beautiful Wiltipoll sheep to graze our paddocks, sheep prefer eating short grass. They won’t eat the longer grass, leaving it to go rank. And I refuse to waste precious diesel slashing long grass for it to mulch back into the soil. We recently purchased 15 Normande cross weaner hefiers. Their breeding and the reasons why we chose them is another story entirely. The short story is we wanted quiet cattle, and they had to be any colour other than black! The Normande is a French beef breed, but you might see that these cattle have an amazing heritage with the best of many breeds in their blood lines. But for now, they got right on the job. Allan Savory recommends a stocking rate of around 60 head per hectare, which is extremely high. The cattle will heavily graze the paddock, eating everything including weeds. Then when the paddock is rested, everything has a chance to recover. Normal set grazing sees the cattle eating their preferred grasses, and avoiding the weeds. This eventually leads to a paddock full of weeds that needs expensive sowing to return to pasture. Just off our yards, we had a small 1/2 hectare paddock, that was perfect for serving two purposes. It allowed us to spend a week socialising the cattle and it allowed our soil improvement program to get right underway. Whilst our stocking rate is about half recommended by Savory, we were soon quick to see the results. Serrated tussock that had been hidden in the long grass was quickly revealed, making it far easier to hack out. 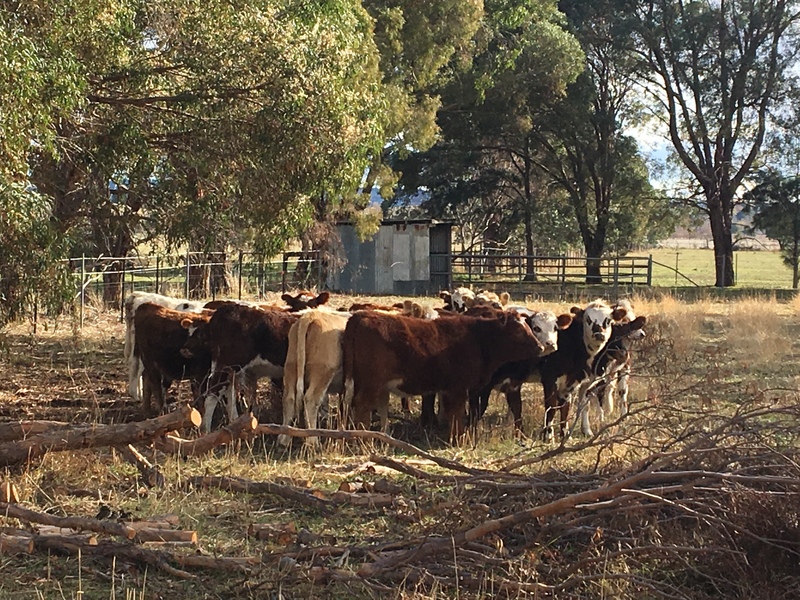 The small paddock was the perfect place for the cattle to be introduced to the Rock Farm. I set up a water trough in the yards, and kept them in overnight after they arrived. The cattle were also drenched on arrival, as our paddocks have been free of cattle for a few years and we want to ensure that our worm burden remains low. For the first week, I fed the young cattle in the yards and let them have full access to the small paddock adjoining the yards. It was remarkable how quickly they stopped running away from me and started walking towards the yards with only a gentle word or two of encouragement. In the space of a couple of days, I was able to comfortably push them into the yards by myself, with the minimum of fuss. I did all my mustering on foot, at a slow measured walk. I found that walking slowly calmed the cattle down, and they rarely would run away from me. The cattle are remarkably sensitive to your body language and where you are looking. A long stick really helps as an extension of your arm, allowing you to direct their movements. The cattle are also curious and soon were happy to watch me as I watched them eat. These beautiful cattle have settled it quickly. We have started moving them around the Rock Farm, and they are learning that a gentle walk is all I want from them. 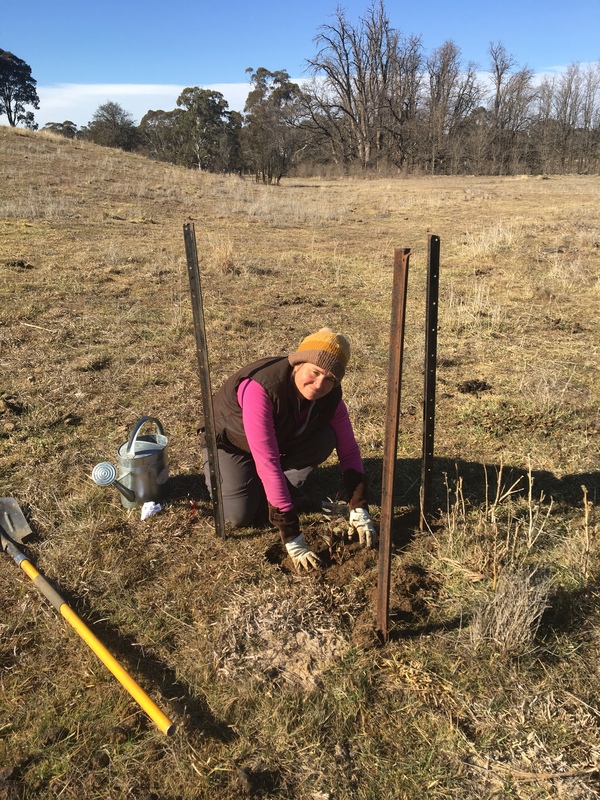 I am madly trying to fix up fences in the small paddocks in order for me to establish a good rotation for them – it is all good fun. In the mean time, they are doing a fantastic job keeping the grass down whilst the tractor rests in the shed. And that isn’t a bad thing!